"Sweet and savory wedges that are a huge hit every time. You won't be able to stop eating these." Place pita breads on a baking sheet; brush each with olive oil. Sprinkle Gorgonzola cheese over each pita bread; top with pear slices and almonds. Bake in the preheated oven until pita bread is crisp and cheese is melted, 12 to 15 minutes. Stir honey and balsamic vinegar together in a bowl until smooth; drizzle over pita pizzas. Cut pizzas into wedges. 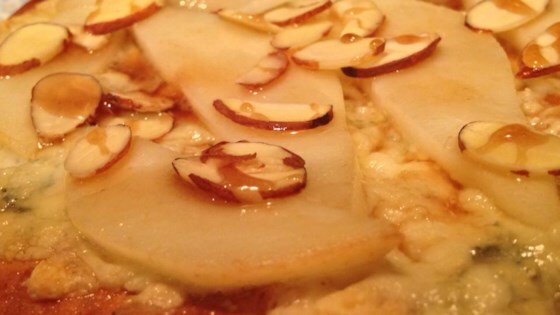 See how to make a delicious pear and cheese pizza with an artisan pizza crust. Don't let the Gorgonzola scare you. Even my 'mild Cheddar crowd' enjoys these appetizers. But I have also made with Monterey Jack cheese with great success. I made the recipe as instructed and it was great! I made it for book club and everyone really liked it. I made this for a cocktail party. Only change I made was I used naan flatbread. Everyone loved it!! Super easy and very tastie! I used a multigrain flatbread instead of the pita. Absolutely delicious! This was a big hit at a recent family gathering. One family member is a vegetarian so she was thrilled to have something other than a vegetable tray to snack on. Made it as the recipe calls for. It was a big hit. So easy will definitely do again. I added a bit more cheese and used sliced almonds instead of slivered. This is a great appetizer, and I will definitely make it again!